From Atlanta’s wealthiest suburbs to its stark inner-city housing projects, a killer has crossed the boundaries of wealth and race. And the people who are chasing him must cross those boundaries, too. Among them is Michael Ormewood, a veteran detective whose marriage is hanging by a thread—and whose arrogance and explosive temper are threatening his career. And Angie Polaski, a beautiful vice cop who was once Michael’s lover before she became his enemy. But unbeknownst to both of them, another player has entered the game: a loser ex-con who has stumbled upon the killer’s trail in the most coincidental of ways—and who may be the key to breaking the case wide open. In this gritty, gripping firecracker of a novel, the author of the bestselling Grant County, Georgia, series breaks thrilling new ground, weaving together the threads of a complex, multilayered story with the skill of a master craftsman. 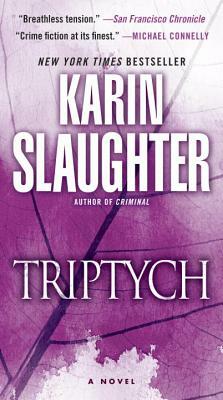 Packed with body-bending switchbacks, searing psychological suspense and human emotions, Triptych ratchets up the tension one revelation at a time as it races to a shattering and unforgettable climax.